Our art program is intentionally unstructured; the intent is not to try to impress parents with art “crafts” that can be identified as a particular object, but rather to let the child explore a variety of art media. Materials are presented but no models are shown, and no attempt is made to have the child copy what an adult has made. The art is each individual child’s creation. We recognize that the “doing” is more meaningful to the child than the finished product. 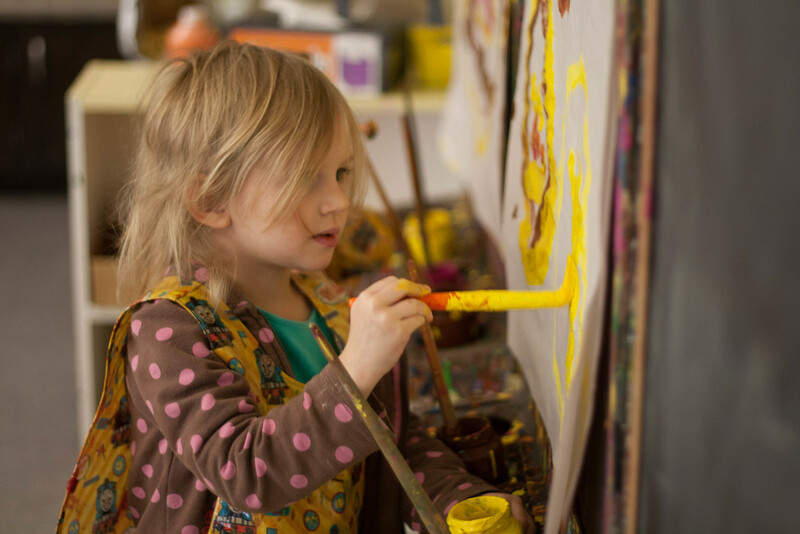 Typical art activities might be finger painting, gluing pieces of wood together, making collages of textured materials, or using different objects to make prints. Our goal is that no two pictures are the same. A large blackboard and our easels are available every day, with rotating paint, water crayons, chalk, cra-pas, charcoal, bingo markers, etc, for whenever creativity strikes! "Older" children (those who are moving on to kindergarten, first or second grade the following year) are informally tested prior to the parent/teacher conferences scheduled in early February. At this conference, accomplishments during the first semester, test evaluations, and any areas of concern are discussed. Then the child's individual plan for his second semester is formed between parent and teacher. Plans for the child's placement in elementary school after Pine Hill are also discussed. Parents of "younger" children (those returning for a second year of preschool) may request a conference at any time also to discuss their child's progress of course; however no testing or formal conference will be scheduled unless there is an area of concern. Our feeling is that the younger child changes in leaps and bounds in the two years before kindergarten, and testing can be premature. Our discipline policy is positive reinforcement, along with redirection, natural/logical consequences, and behavior modification. We do not espouse a "shame-on-you" approach. Teachers do not yell or frown. The staff has been specially trained to be patient yet quietly authoritative, and consistent. We recognize that children do not arrive at our doorstep well-behaved and focused; it is our job to help them become properly socialized and consider the feelings of others, and we work to that end. We have found, along with our philosophy, that having a properly prepared environment with multitudes of choices, and respecting the fact that children need ample time to pursue their choices, classroom management is simplified enormously. We recognize that children are not built to sit still for long periods of time, nor can they reasonably be expected not to talk for very long. We strike a balance between where they are now and where they need to be a year from now, and proceed to that end — but cautiously. We always want to fiercely guard their spirit! The playhouse area is used not only to enable the child to act out his world at home (the first semester) but also, during the second semester to play different roles in several theme areas. For one or two weeks each, the playhouse is converted alternately to a grocery store, a restaurant, a hair salon, a barnyard, a Hawaiian beach, a Southwest campsite, a castle, and a flower-arranging shop. There are many props and costumes with each theme, providing the materials to "fire up" the child's imagination. Field trips are a big part of our program for Kindergarten and First and Second grade; we take about ten each year, and some of them vary from year to year. Some trips are "just for fun" and others go along with our units (and are also fun!). We strive for trips that have a hands-on approach. Some trips might include: the pumpkin farm & wagon ride, the fire station, the planetarium, Bouncemania, McMillen Health Center, an Amish farm, and many more. There is an activity fee, paid at the beginning of the year, which covers admissions fees to the venues. All of the Kindergarten and First and Second Grade children go together, either morning, afternoon or full day, depending on the trip. We believe field trips enhance literacy. Our students create journal entries after the trip about the high points, when certain things happened, what we learned from the trip, etc. Children are curious about the world outside their home and school, and these outside experiences aid in the maturing process. For the younger children, we bring in community visitors, such as a police officer, firefighter, veterinarian, sculptor, ambulance EMT and driver, and more. First and Second graders are housed in their own room within our new Primary Suite. The curriculum follows the Indiana State Standards Curriculum, but typically go on to higher skills (multiplication/ division etc.) because of the small student/teacher ratio. They conduct science experiments outdoors in all kinds of weather and can be seen tramping around in the snow with gauges, and measuring rainfall. Nature collections/observations are gathered and studied. Chapter books are introduced and they keep first grade journals as well as creative writing/storybook journals. Long-term projects involve such units as The Solar System, Continents, and U.S./World geography. Pine Hill offers an exceptional Kindergarten program, limiting class size to twelve students with one teacher. There are four curricula in place to provide for individual differences: Remedial, Regular Kindergarten, Second-year Kindergarten, and Fluent Readers. The majority of students are enrolled in Regular Kindergarten, but each year there are three or four students who require one of the other three curricula. Nevertheless, all work together as a cohesive unit. Some of their time is as a team, learning to work alongside classmates, and they are encouraged to provide support for each other. Classwork is not a race, but an individual endeavor. Respect is encouraged and expected for all, regardless of ability. Kindergartners spend the first hour of the day in the Kindergarten room, doing discussion, recitation, blackboard work, group games, and curriculum papers. They are then "checked out" (on phonic sounds, power words and numerals) each day before leaving the room to enter the "centers area" where they may mingle with the younger students and enjoy free play. Full-day Kindergartners are in the Kindergarten room either morning or afternoon, but not both. The alternate session is spent doing center work on "contracts" and more free play, or perhaps "tutoring" a younger child. See "Language" and "Math" for more on what the Kindergartners do. Kindergartners at Pine Hill wear uniforms, though there are occasional "dress-down" days each month. Though we begin the introduction of phonics immediately to children of all ages, we strongly believe that children have different starting points, due to different levels of experience. Our philosophy is to "take each individual child where he is and proceed from that point". Beginning consonant sounds are introduced first. Kindergartners (as well as the older children) learn vowels, blends, and digraphs. The movable alphabet is used with the older children to make "families" of phonetic three-letter words. Children begin this at various points during the year, when each is individually ready, generally after they can recognize the sounds of about ten consonants. Children have the opportunity to read their words to the class during group time if they so choose. Children may begin reading easy books at any age when ready. All children at Pine Hill are authors; stories are dictated to the teachers, who write down what the child says verbatim. This is an every-month activity. Kindergartners keep journals. They dictate at the beginning of the year and move into writing on their own, using phonetic spelling by mid-year. All older children, both preschool and kindergarten, print monthly theme books, learning how each letter is formed. In addition to phonics, whole-language is used. We believe it is a combination of the two that aids in reading. Children are read to every day, and books are sprinkled in different centers throughout the classrooms. Our gymnasium offers children the chance to move freely, run, skip, jump, bounce balls and play organized games such as skipping rope, parachute activities, soccer, hockey, basketball, relay races, obstacle courses and more. Gymnastics is offered the second semester with a local academy which comes in monthly. Every day children use the playground: morning, lunchtime, and afternoon. All-terrain tricycles are used on the spacious paved and gated driveway. Children who attend Pine Hill all day have already paid for their lunch hour on the tuition plan. Children not on the tuition plan may "drop in" for lunch, simply by sending $5 in an envelope marked with his name and a lunchbox. It is not necessary to tell us beforehand, except to order food on special lunch days, such as pizza. A whole or half sandwich of protein, either peanut butter, or lunch meat & cheese, or tuna or chicken salad. A baggie of veggies, like carrots, celery, etc. & maybe ranch dip. Fresh fruit — apples, bananas, strawberries, etc. and raisins & nuts. It may seem "fun" to put candy or potato chips in the lunchbox for a surprise, but we advise moderation! Once every couple of weeks is sufficient, so that bad habits are not built. Resist giving in to complaints; eventually children crave what they get most often — and hopefully it is an apple over a candy bar. We have three special days each month, "Pizza Day", "Hot Dog Day", and "Pasta Day". The cost is $1.50 each piece and orders/money are due into the office three days prior. 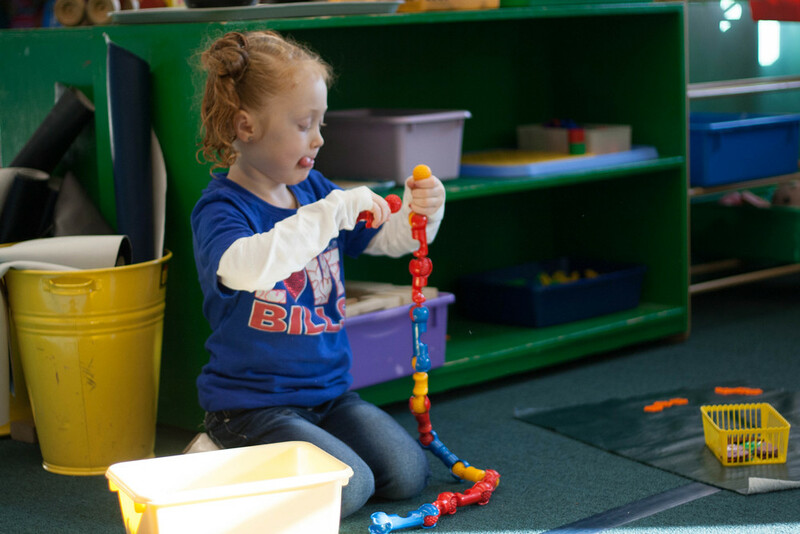 Children learn abstract math concepts the best through concrete manipulation, and we use multitudes of materials such as Cuisenaire rods, Montessori red-and-blue rods, cylinders, and teacher-constructed games. Kindergartners are introduced to Touch Math, using their fingers to find the “touch points” of each numeral, enabling them to add and subtract quickly. The goal for preschoolers is to be able to recognize and print numerals to 20, do simple addition and subtraction, count to 30 without skipping (in Spanish as well), understand “more” and “less”, learn math vocabulary words (such as “before” and “after”) and to understand what a number means. They make “sequence trains” and patterns with the Cuisenaire rods. Kindergarten, First & Second Grades recognize, count and print numerals to 100 and beyond, and skip-count by tens, fives, and twos. Place value, fractions, and beginning geometry are introduced, as well as double- and triple-digit addition and subtraction (with and without regrouping). Cuisenaire rods are used to make crossword puzzle pictures to find solutions to math problems. Story problems are both solved and invented by students. Calendar math is practiced, culminating in the "one-hundred day party" in February. First and Second graders will have daily individual math cards tailored to their strengths and what needs strengthening by their instructor. Using this method, our students far exceed the Indiana State Standards for First and Second Grade math skills. More importantly, these customized math cards are bound together and given to the parents to take with them so that our graduating students will be able to show their new school tangible, everyday examples of how advanced their math abilities are. Our overall goal is to help children see math, and its value, in their everyday lives! Manipulatives are those activities that include construction coupled with imagination: Lincoln logs, gears, Legos, lottos, pegboards, waffle and bristle blocks, marble runs, and more. These activities aid in the development of fine motor skills, as well as problem solving. They are frequently a catalyst to co-active play, learning to work together in harmony. Music is a big part of the child's day at school. Singing along with guitar accompaniment or tapes, movement and rhythm, and musical games are practiced daily. Children learn to clap on the beat (and off the beat) and use instruments. We give a Fall singing program for grandparents, a holiday singing program in December, and the Daddy Ice Cream Social singing program in February. In March/April our annual costumed opera is presented, and the year is concluded with a graduation singing program/potluck picnic on the lawn. There is puppet loft and an outdoor stage on the playground. Many children learn to sing on pitch during their stay at Pine Hill, but the primary purpose is to let children discover the sheer joy of music. Games are available in the perceptual skills center that help to awaken the child's discovery of likenesses and differences, putting objects in categories, and copying patterns. Memory games, sequencing, graphing activities, and exercises involving relationships between objects are the focus of this area as well. The Practical Life activities enable children to engage in "purposeful work", which they perceive as doing something important. In addition, since it involves the hand, it helps to develop fine motor skills. Activities include using implements like tweezers, pipettes, eye droppers, turkey basters, hammers, scrub brushes. tongs of various sizes, sandpaper, clothespins, etc. Screwing lids onto jars, lacing beads, dropping pennies into bottles, polishing shoes, cutting up carrots, blowing bubbles, pouring liquids, and scrubbing pumpkins are typical endeavors. The paper shelves are filled with various types and shapes of blank paper, stencils, tracing, and cutting activities. Crayons, markers, stickers, and paper punches are available every day, not as part of any particular art project, but always present for the child to create whatever he desires. Parents send in "junk" for the recycling shelves on a daily basis. In September, our science/nature center them is "The Ocean". Some children have just experienced beach life over the summer. The nature table features collections of shells, coral, and sea life, such as seahorses, sand dollars, starfish, shark teeth, "witches purses", etc. and shelves feature lotto games and puzzles of sea life. Children can sort all kinds of beach articles. Models of sea animals can be played with, such as a rubber jellyfish floating in a bowl of water. October features tree life and leaves. Trays of "things from the woods" can be explored, leaf stamps and ink stamp pads are available, and leaf tracing and rubbing exercises appear on the shelves. November features animals getting ready for hibernation. Real animal parts can be touched, such as skeletons, claws, furs etc. Mammals are studied. In December, snakes, frogs, turtles and the like, are explored. Old snake skins and turtle shells are touched, and the life cycle of a frog is put together. January is physics month. There are things like valves to turn, the pennies cone, scales to balance things, kaleidoscopes, spinners, planes and inclines, gears, and tornado tubes. February features experiments: What floats and what doesn't? Which things are magnetic and which aren't? After demonstrating individual experiments to the class, the teachers place these in the science center for the children to do with their friends. For example: Put a little scrap of paper in the mouth of an empty soda bottle. Try to blow it into the bottle. What happens? Amid squeals of delight, children repeat the experiments over and over. The idea behind the experiments is not necessarily to teach scientific principles, but rather to teach children that science is fun. March is Geology month. Rock samples, and several different types of sand and dirt can be felt. There are sorting bowls, bingo games, volcanos to create over and over. There are many other things such as fossils, arrowheads, lava samples, and more. Big plastic dinosaurs trudge through the mud in the water table! April has several themes: Flowers, Birds, and Animal Babies. Domestic, farm, zoo, and rain forest animals and their habitats are studied. Children plant seeds and watch them grow. We have loads of detailed bug models, collections and games. In May, we visit an Amish farm and hold our annual dog show on the outdoor stage. In addition, all through the year there are science-related books in this area, as well as tracing, dot-to-dots, and stencils of things in the natural world. Our animals live out their existence in the Science Center: hamsters, turtles, fish, newts, hermit crabs, Madagascar hissing cockroaches, crickets, and spiders and other bugs. The children can feed, touch, and observe some of these creatures. Our recurrent theme throughout the year is to respect all creatures, and the children pledge to be kind to all animals. It is a well-known fact that children learn best through their senses. Our "water table" holds something different every week: plain water, colored water, soapy water, sand, mud, snow, rice & beans, dry pasta shapes, hand cream, "goop", jello, and more! It is also used to wash dishes, wash clothing, and bathe dolls. Containers, pumps, tubing, funnels and many other tools are offered. Children at Pine Hill are exposed to Spanish all through the school day, not just in "lessons", but in actual conversation with fluent staff members. Spanish is heard every day; directions are often given in Spanish and the opening exercises (calendar, weather, etc.) are done in both English and Spanish. Children learn new vocabulary words at the beginning of the school year, such as colors, animals, parts of the body, and objects in the room, then phrases are introduced. Understanding comes before speaking, and the children begin to understand such commands as "Please sit in the red chair" by the end of September. Because half of the students are in their second or third year at Pine Hill, they help the new students understand and speak. All year long Spanish songs are introduced, and during free sessions, games like Spanish vocabulary bingo are going on in the room in a small group. Because of the bilingual nature of our school we place an emphasis on multicultural understanding. Though this is ongoing during the school year, the month of February is specifically concentrated on "Asian Week", "Hispanic Week", "European Week", and "African Week". Children cook ethnic treats, wear ethnic costumes, and hear stories and sing songs from other nations. We encourage visitors to come in and talk as well. Our goal is to help children learn tolerance for all peoples.